Tired- but happy. The surf is slowly fading but there are still intermittent head high waves. We're all a little worn out- but it's a good type of tired. Check out today's photos (also check out the new postings on the surf and beach link) and if you still want more, try this one out- it's my latest project. Top Photo: Roof riding- all 10' and 270lbs thrown up onto the lip. Definitely the path less chosen. Bottom Photo: I love summer time! 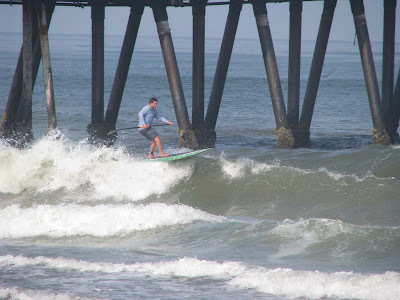 JOHN SURFED CENTRAL AND THE PIT ON SAT 7508 CAUGHT SOME GOOD WAVES TILL THE RED SHORTS SAID HEY YOU CANT BE DOING THAT HERE.CAPTNEG9 GREAT PICS OF CHAD ON A BENDER.I THINK THE FELLOWS FROM I.B. PADDLE SURF BETTER DUE TO THE BEACH BREAK.DO I MAKE SENSE. Are you telling me that Stand Up is now banned at the Sea Hag's beach? Or was it just a black ball for all boards? What's the deal? And yes, you do make sense... but what's with the all CAPS are you yelling at me?